Tradecraft: Book Two of the Back to Normal Series. <br /> The thrilling time travel saga that begun with Paradigm Rift now continues. <br /> Just as Area 51 scientists make a remarkable discovery concerning Denver Collins' wallet, explosive evidence mounts that a murderous saboteur lurks within the upper echelons of CIA Project SATURN. <br /> With a persistent newspaper editor attempting to connect all the dots, even a revolutionary time travel breakthrough by the researchers in The Basement might be tragically too late. Denver Wayne Collins remains unconscious behind bars, an FBI dragnet is sweeping the Midwest, and a relentless Russian assassin tracks down their hidden location. <br /> Normal&#x2019;s Jumpers are running out of time. <br /> The Back to Normal Series is a thrilling mix of history, mystery, and conspiracy. From Area 51 to Roswell, from present day to the beginnings of the Cold War, follow the gripping account of a desperate group of time jumpers hunted by the CIA /KGB and hounded by their own pasts. <br /> This four-book saga will challenge the way you understand contemporary world history...and even time itself. 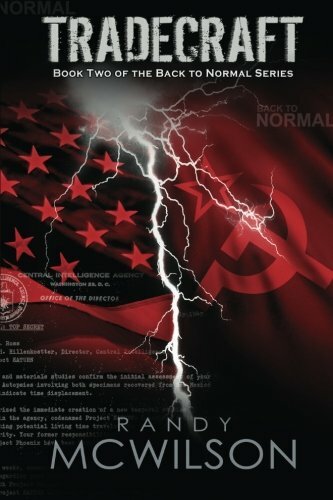 <br /> TRADECRAFT is the sequel to PARADIGM RIFT, Book One of the Back to Normal series.